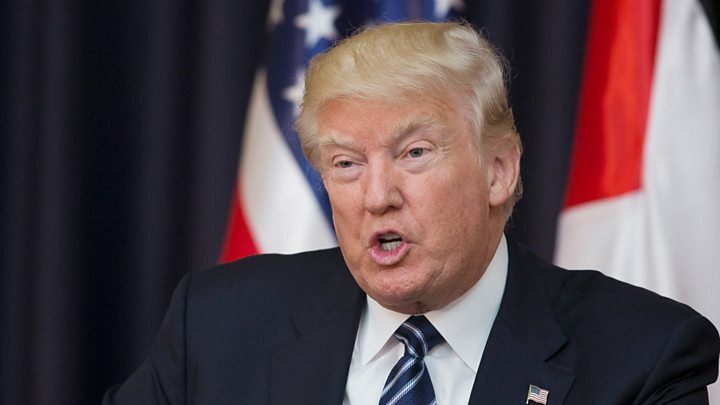 US President Donald Trump has said he will "do everything" to help Israelis and Palestinians achieve peace. At talks with Mahmoud Abbas, he spoke of being gratified that the Palestinian leader had committed to taking necessary steps to "fight terrorism". Israel and the Palestinians have not held peace talks for three years and Mr Trump acknowledges it would be "one of the toughest deals of all" to broker. This is the last day of the US president's visit to the Middle East. In both the occupied West Bank and Gaza, Palestinians have held protests against the trip and in support of a hunger strike by Palestinian prisoners in Israeli jails. On Monday, Mr Trump said he had come to "reaffirm the unbreakable bond" between the US and Israel and that there was a "rare opportunity to bring security and stability and peace" to the region. He flew to Tel Aviv direct from Saudi Arabia, where at a summit on Sunday he urged Arab and Muslim leaders to work together to "drive out" Islamist extremists. Mr Trump said he had come to Bethlehem, where the meeting with Mr Abbas was held on Tuesday morning, "in a spirit of hope". "I am committed to trying to achieve a peace agreement between the Israelis and the Palestinians," he said. "And I intend to do everything I can to help them achieve that goal. He added the president of the Palestinian Authority had assured him he was "ready to work towards that goal in good faith", and that Israeli Prime Minister Benjamin Netanyahu had promised the same. Is 'thumbs up' actually controversial? Mr Trump also said that he was "gratified" that Mr Abbas had attended the summit in Riyadh and "committed to taking firm but necessary steps to fight terrorism and confront its hateful ideology". "Peace can never take root in an environment where violence is tolerated, funded and even rewarded," he added, apparently referring to payments made by the PA to the families of Palestinian prisoners and those killed in the conflict with Israel. 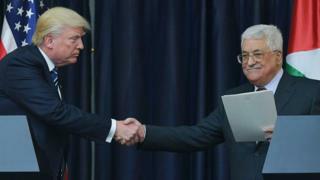 Mr Abbas welcomed Mr Trump's "noble and possible mission". "I would like to reiterate our commitment to co-operate with you in order to make peace and forge an historic peace deal with the Israelis," he said. The US president began his statement with a condemnation of Monday evening's suicide bomb attack at a concert in Manchester. "So many young, beautiful, innocent people living and enjoying their lives murdered by evil losers in life," he said. Just what did Trump's note say? 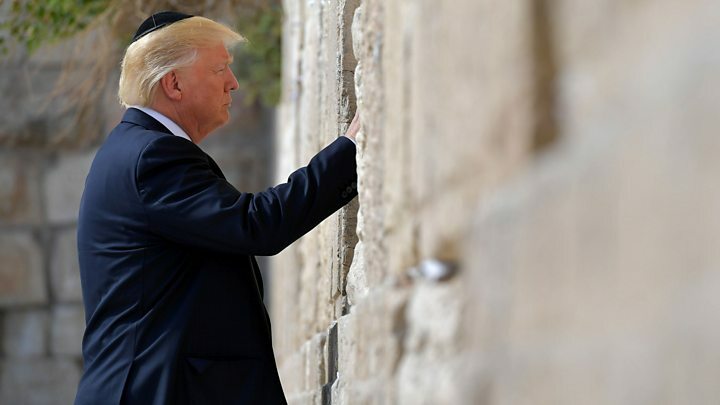 Later on Tuesday Mr Trump returned to Jerusalem, visiting the Yad Vashem Holocaust memorial. And in a speech later at the Israel Museum, he reaffirmed that his administration would always stand with Israel. But he said his trip was "focused on bringing nations together", adding that the Palestinians were "ready to reach for peace". President Trump sees himself as a great dealmaker, with the personality to cut through the difficulties that have defeated lesser people. The only credible ideas still require the creation of a sovereign Palestinian state alongside Israel. The reality is that the Israelis and Palestinians are way apart on the main issues - the future of east Jerusalem, the fate of Palestinian refugees and the borders of an independent Palestine. The two sets of leaders also do not trust each other. The West Bank, including East Jerusalem, has been occupied by Israel for 50 years. Some of the most influential members of the Israeli government believe the land is a Jewish possession, given by God. The Palestinians are deeply divided, with Fatah in charge in the West Bank and in Gaza the Islamists of Hamas, who have been condemned by President Trump in the last few days as terrorists. It is highly unlikely that even President Trump's outsized personality will be enough, on its own, to end a conflict that has lasted more than a century. Making this deal is not about fixing a price - it is about reconciling enemies with radically different world views. On Monday Palestinians gathered at military checkpoints around the West Bank to protest against Mr Trump's visit, and over conditions in Israeli prisons. Hundreds of stone-throwing youths clashed with Israeli soldiers firing tear gas and rubber bullets. At least one person was injured at the Qalandia checkpoint near Jerusalem. In the Gaza Strip, other Palestinians trampled photos of the US leader and, according to Reuters news agency, burnt an effigy of him. A "day of rage" has been called for Tuesday by the Palestinian prisoners' committee. Hundreds of jailed Palestinians have been on hunger strike since 17 April. Activists were hoping to hold up protest banners in Bethlehem on Tuesday to make Mr Trump aware of the action. What is the settlement issue all about? What did Mr Trump say about Iran? Speaking in Jerusalem on Monday, he promised that Iran would never have nuclear weapons and accused it of supporting "terrorists". "Iran will never have nuclear weapons, that I can tell you," Mr Trump told Mr Netanyahu. In return, Mr Netanyahu extolled the US president's leadership. 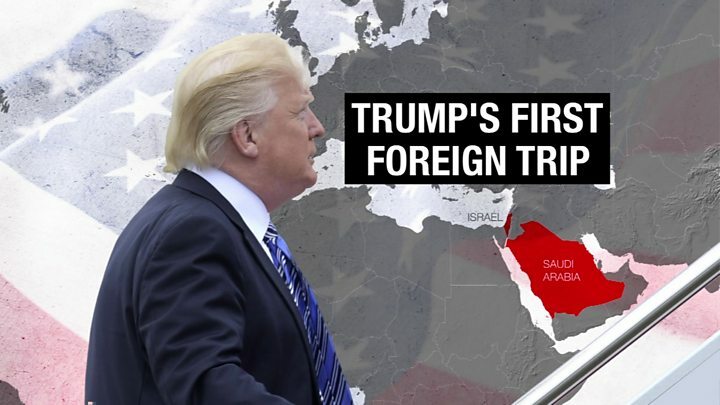 Iranian President Hassan Rouhani played down Mr Trump's strong criticism of Iran at a summit in Saudi Arabia at the weekend, saying: "Who can say regional stability can be restored without Iran?" Have his domestic troubles pursued him abroad? His first foreign trip as US president has been overshadowed by political difficulties at home. Speaking to Mr Netanyahu on Monday, he sought to dispel suggestions that he had passed on sensitive Israeli intelligence to Russian diplomats at a recent meeting, saying he had not mentioned the word "Israel" at the meeting. What's next on the tour? Mr Trump has now flown to Rome ahead of a meeting with Pope Francis. On Wednesday he will continue to Brussels to see Nato leaders. On Friday, he will return to Italy to meet other world leaders at a G7 summit in the Sicilian town of Taormina, where climate change is expected to be discussed. Media captionWhat's on the agenda? What's happening on Trump's first foreign trip? What does Trump mean for Israel? Video No Middle East talks - why?